Renault's modern Tangier plant is expected to reach an annual production capacity of 400,000 vehicles. 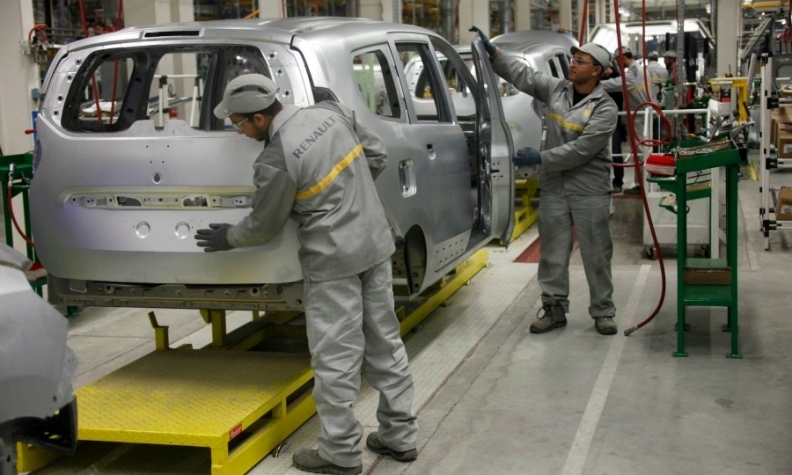 RABAT, Morocco (Reuters) -- Renault, together with a partner group of suppliers, will invest 10 billion dirhams ($1.04 billion) in Morocco to build an "industry ecosystem" to help boost local production of components. The investment will help raise Renault's local sourcing of components to 65 percent from 32 percent and is projected to generate 20 billion dirhams in revenues, Morocco's industry minister, Moulay Hafid Elalamy, said. Renault has two car plants in the country. Its modern factory in Tangier produces Dokker, Lodgy and Sandero models alongside body pressings for export. The second older plant in Casablanca builds Logan and Sandero models. Morocco expects auto industry exports to reach 100 billion dirhams a year by 2020 as a result of PSA/Peugeot-Citroen's decision last year to build a 557 million euro factory in the country, slated to produce 200,000 vehicles a year. The country has attracted a number of big auto and aerospace investors in recent years, including Delphi, Bombardier and Eaton Corp. Unlike many countries in the region, Morocco has managed to avoid a big drop in foreign investments in the wake of the global financial crisis and the Arab Spring uprisings of 2011, partly by marketing itself as an export base for Europe, the Middle East and Africa.